This 68 yrs old female was admitted to the out patient clinic with a two weeks history of macroscopic hematuria. On a intravenous pyelogram a large defect was present in the upper pelvis of the left kidney. 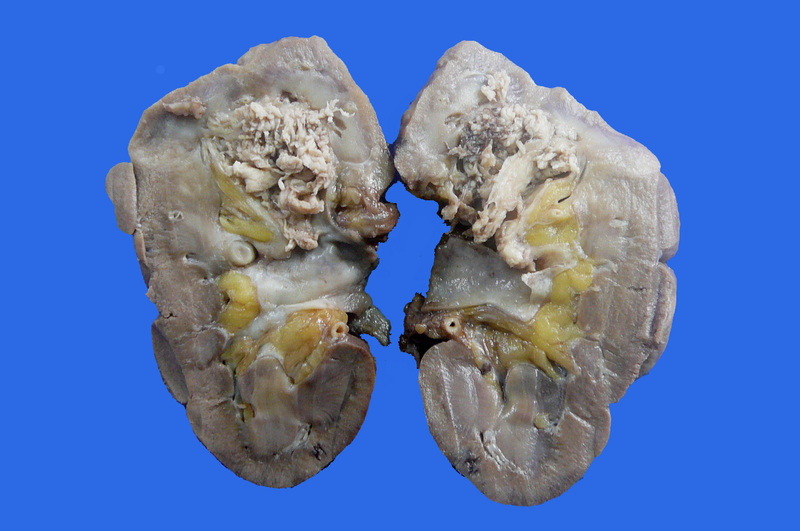 A diagnosis of probable carcinoma of the pelvis was rendered and a total nephrourectectomy was done. A large papillary tumor fills the upper pelvis (Fig 1.). 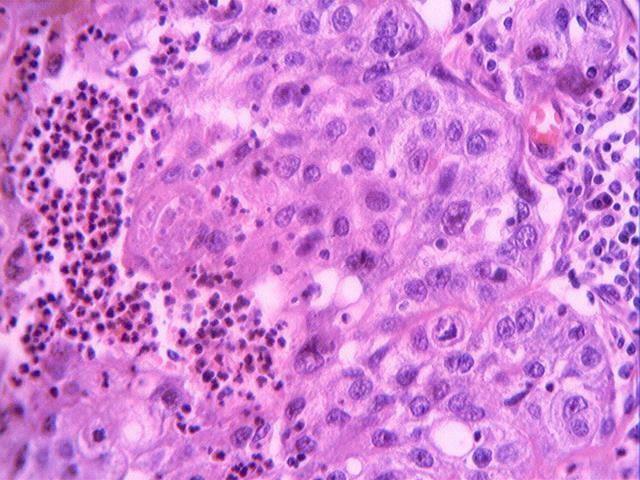 Microscopic examination shows a carcinoma with large undifferentiated cells with a clear cytoplasm and ill defined cell borders, giving the tumor a syncytial appearance. A heavy lymphocytic infiltrate is present, (Fig. 2). In other areas, the syncytial pattern was made of large eosinophylic deciduoid cells with a heavy leucocytic infiltrate (Figs. 3 and 4). High grade urothelial carcinoma with pleomorphic nuclei and necrosis is present (Fig. 5). 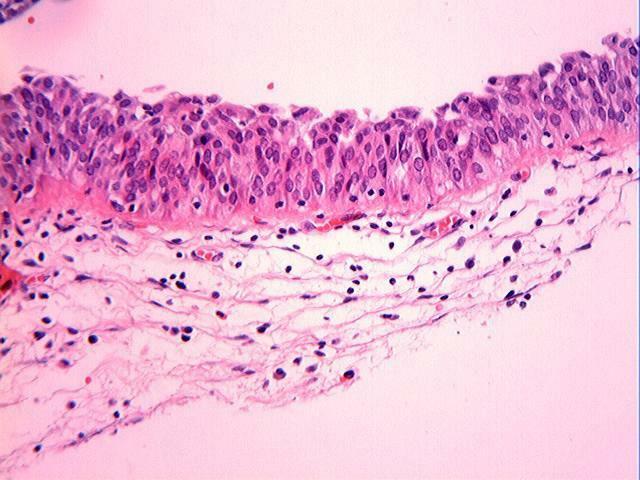 Unusual form of intrabular spread of the neoplastic urothelium into the collectings tubules is seen (Fig. 6). Areas of the dysplastic urothelium are present adjacent to the tumor (Fig. 7). 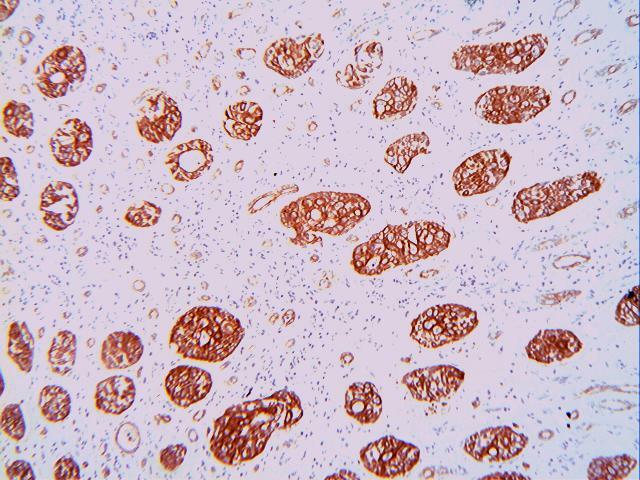 Cytokeratin staining with cytokeratin AE1/AE3 of the tumor cells is present (Fig. 8), as well as in the tumor located in the collecting tubules (Fig. 9). Primary urothelial carcinoma of the upper urinary tract accounts for 7%-10% of all urothelial tumors. In the renal pelvis corresponds to 5% of all urothelial tumors (1-3). 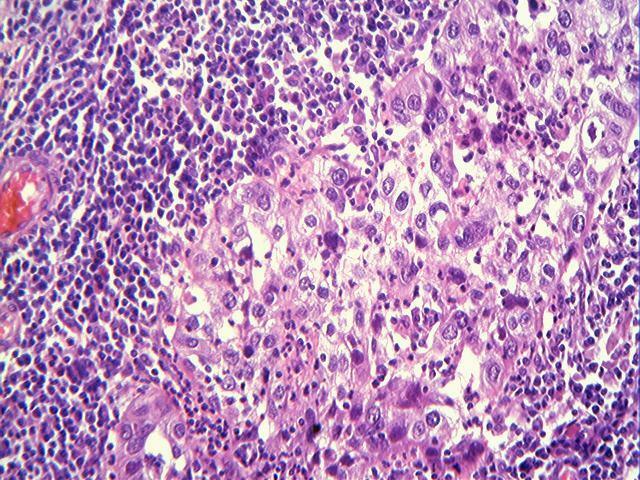 The term lymphoepithelioma was coined in 1921 by Regaud and Schminke (4,5) to describe a tumor in the nasopharynx of Asian patients. This tumor characteristically is composed of cells with large nuclei and indistinct cell borders which impart a syncytial pattern to the tumor and it has an abundant lymphoplasmacytic inflammatory component that sometimes obscures the epithelial nature of the tumor. In this location there is a close pathogenetic link to Epstein-Barr virus (EBV) and EBV genomes have been indentified both by in situ hybridization and polymerase chain reaction. 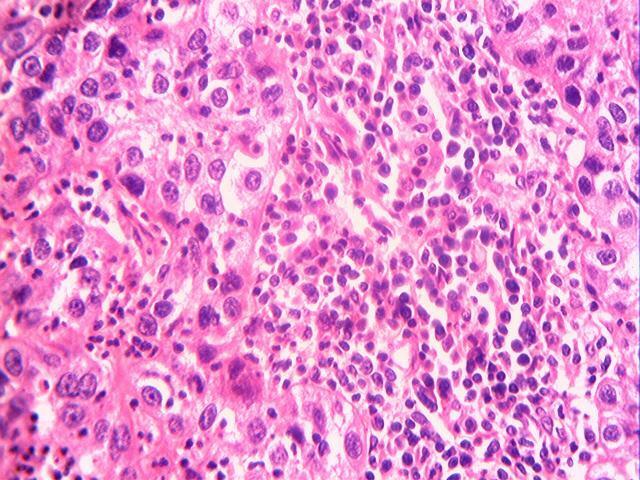 With this phenotypic hallmark lymphoepithelioma-like carcinomas outside the nasopharynx were soon described. This included a variety of organs such as salivary gland (6), thymus (7), skin (8), stomach (9), lung (10), breast (11) and uterine cervix (12). In the urinary tract the vast majority are located in the bladder (13-19). Sporadic cases in the urethra, the ureter and in the prostate gland (20, 21, 22, 23). In the renal pelvis only 8 cases had been reported (3,24, 29). In five of these cases, viral genome for EBV was tested with negative results. 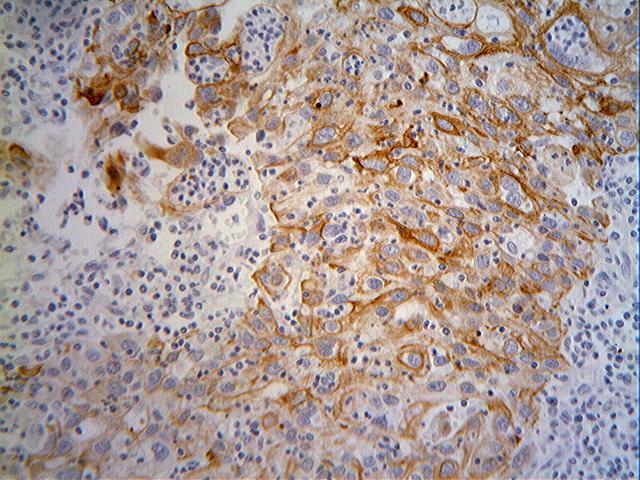 Negative results for EBV-encoded RNA were found in a series of 28 cases of lymphoepithelioma-like carcinoma of the urinary tract reported by Tamas et al (26). This data confirm that EBV is not a pre-requisite for the development of lymphoepithelioma-like carcinoma phenotype in the urinary tract. 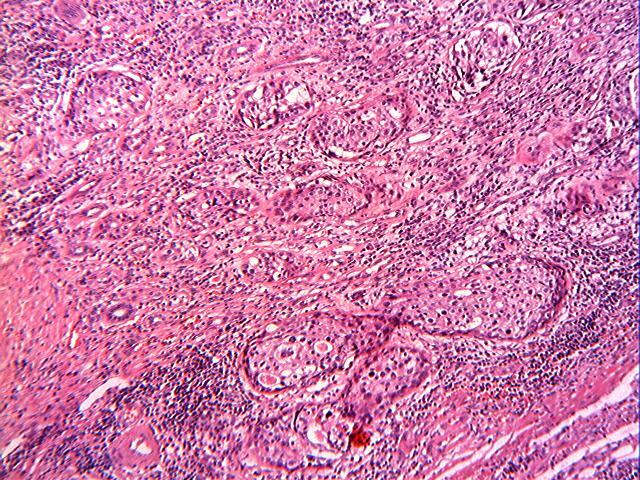 The unusual form of intratubular spread of the tumor into the collecting tubules in which the neoplastic urothelium lines and in some cases fill the lumina of these tubules without infiltration of the surrounding renal parenchyma is a rare pathological feature described in urothelial carcinomas of the renal pelvis and has been compared to the similar process of cancerization of ducts or lobules observed in breast carcinoma (3,30). Porcaro AB, Gilioli E Migliorini F, et al. 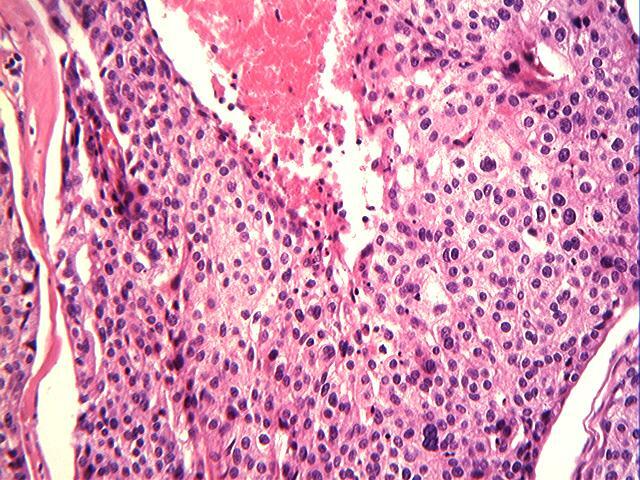 Primary lymphoepithelioma –like carcinoma of the urinary bladder. Repor of one case with review and update of the literature after a pooled analysis of 43 patients. Int Urol Nephrol 2003; 35:99-106. Allende DS, Desai M, Hansel DE. Primary lymphoepithelioma –like carcinoma of the ureter. Ann Diagn Pathol 2010; 14:209-214.